Edgehill defeated Scarborough News Saturday League division one leaders Filey Town to boost their title hopes while Newlands also maintained their hopes of defending their title with a 1-0 home win against second-placed West Pier. Filey Town took the lead at Staxton 10 minutes before half-time through Phil Dickens’ header from Tommy Wilson’s great free-kick, but Steve Clegg’s Edgehill troops sparked into life after the interval. Filey had a goal by James Pinder disallowed for offside before Ricky Greening levelled the scores with a curling shot into the bottom left corner of the net, and striker Danny Collins scored from close-range after a goalmouth scramble to make it 2-1. 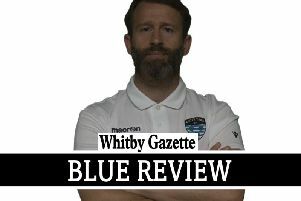 In the 87th minute Town keeper Jon Binks fired a 50-yard free-kick into the net and looked to have earned his side a valuable point but it was disallowed by referee George Roberts as it was an indirect free-kick, although Filey Town protested that Edgehill keeper Martin Cappleman had bundled the ball into the net. Jordan Philliskirk receiving his marching orders for arguing with Roberts about the decision. A minute later Lloyd Henderson capped a fine display with a third goal for the hosts, tapping in after a fine run and pass from Greening. Clegg said: “That really opens the title race up now and I am very happy with the lads played. The best three players on the day were brothers Lloyd and Kurtis Henderson and centre-back Jason Darling. Lloyd started at centre-back and Kurtis central midfield and swapped roles at half-time. Newlands worked hard for a 1-0 home win against West Pier, boosting the hosts’ chances of defending the title and at the same time denting Pier’s title bid. Adam Stride scored the only goal of the game after only 10 minutes, Sean Exley sending in the low cross for Stride to slot his shot past the Pier keeper. Newlands had a few half-chances after the interval but failed to add to their tally but first-class defending from Ricky Nock, veteran Nick Beal and Kile Fields kept the Pier forwards at bay. Winger Daniel Freer was also on top form for Newlands while the star Pier players were Will Jenkinson and Chris Nelson. Seamer Sports earned a fine 2-0 home win against fellow mid-table side Whitby Fisherman’s Society. The villagers opened the scoring through Matty Forsyth’s fierce 15-yard shot after Gaz Lawton’s shot had been parried by keeper Paul Cull. Whitby started the second half strongly but Seamer regained control thanks to a second goal, Luke Tinker applying the finish. Tinker was denied a second goal when Cull pulled off an amazing save to deny him, having also made a superb low stop to deny Joe Gallagher earlier in the second half. Filey Town Reserves only need a point from Monday’s game at FC Rosette to win the second division title after easing to an 8-0 win at nine-man West Pier Reserves. Martyn Jenkinson banged in four goals while Joe Gage hit a hat-trick and his brother Max headed in the other goal. FC Rosette’s mathematical chances of staying in the second division were quashed by their 3-2 loss at Athletico2B. Sam Swift opened the scoring for the Cats after a fine through-ball from Shaun Dodson, but Wayne Shaw levelled before half-time for Rosette. Ben David, who was having a fine game in central midfield upon his return to the team after a long absence, headed in powerfully to restore Athletico2B’s lead, and Dodson sealed the win with a lob after a fine through-ball from Sam Medd. Lee Wardle pulled a goal back for Rosette, but the Cats had done enough to secure the points. Leon Dunn and Ben David played well for the home side but their man of the match was central midfielder Tyler Richardson, who put in a great shift. Falsgrave Athletic have all but wrapped promotion from division three after a 12-0 home win against eight-man Ayton Reserves. The visitors battled hard throughout the 90 minutes and limited the hosts to a 1-0 lead after 30 minutes, but Lee Smyth’s charges struck four more goals before half-time and then scored another seven in the second half to boost their goal difference to 19 more than third-placed Cayton Corinthians Reserves. Cayton will now need to beat champions Seamer Sports Reserves by 20 goals in their final game on Saturday April 11 to edge into second spot, so Falsgrave were in the party mood after the game with a spot in the second division now within touching distance. Mikey Anderson was on top form with four goals while winger Lewis Short struck a hat-trick and striker Mark Reddy a brace, Zak Hansen, sub Joe Sunter and Paul Reddy also notching. Ayton boss Jon Hick, who was forced to play the full 90 minutes in defence to help his team out, said: “I am proud of the lads for battling through 90 minutes, and creating a few chances as well, Luke Foster was very unfortunate to see his shot hit the post in the second half. Commercial and Sleights Reserves shared the spoils after a thrilling 3-3 draw. Tom Sutherland opened the scoring for Luke Jenkinson’s home side and then Macaulay Youngson headed in Azza Birley’s cross to put the hosts in charge at the break. Sleights refused to submit and levelled on the hour mark through Rob Ingham, who limped off the pitch with an ankle injury shortly afterwards. Jim Niel’s header levelled the scores and then Simon Taylor’s cracking shot looked to have earned a win for Sleights but Sutherland volleyed home the leveller 10 minutes from time to earn Commercial a point. Adam Young was the man of the match for Sleights at left-back, while the whole team shared the Commercial award for a top-notch display.